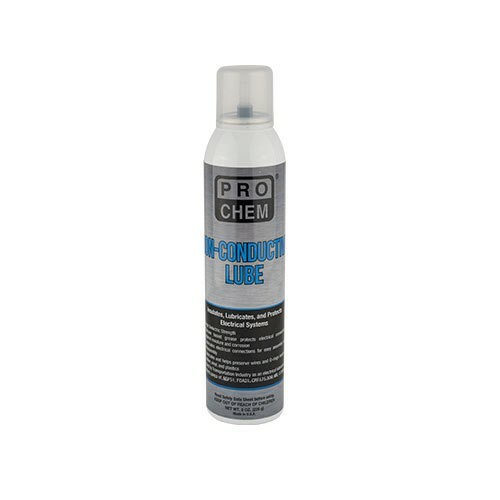 NON-CONDUCTIVE LUBE | Pro Chem, Inc.
NON-CONDUCTIVE LUBE is formulated from low molecular weight, pure Polydimethylsiloxane base oils and selectively treated with rust, oxidation and anti-wear additives coupled with a shear stable thickener to provide maximum parts protection in a wide range of temperatures from -85°F to 550°F (-65°C to 287.8°C). This product is non-melting, has a high dielectric strength, low volatility and is insoluble in water, methanol, ethanol, dilute acids, caustics, glycol, glycerine, vegetable and mineral oils. The long service life and chemical resistance of NON-CONDUCTIVE LUBE makes it an excellent lubricant and sealant for many valves including plug, pressure, vacuum and control. It is a very effective lubricant for O-rings and other rubber or plastic applications. It is an excellent choice in a wide variety of automotive, marine, agriculture, household and industrial applications. Apply directly to area of use.